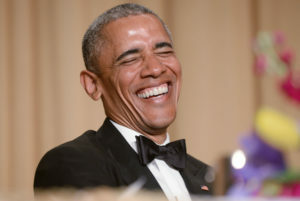 President Obama’s performance at the White House Correspondents Association dinner on Saturday seemed carefully calibrated to deliver one overarching message: the president no longer cares what his critics (read: white people) think. During much of his six years in office the White House appeared to go out of its way to avoid giving Republicans fodder to use in attacking him. But that no longer is the case. Many publications noticed, with headlines that sent out the message: President Obama doesn’t have any more f**ks to give. Jokes aside, the question now is whether this attitude will carry over into the politics in his last 20 months in office. Will he use every option in his toolbox to get around the Republican Congress and try to shape the country in his image—including going out of his way to help his people, the Black community? Perhaps he will follow up the nomination of new Attorney General Loretta Lynch with a string of Black appointees. Maybe he’ll start signing executive orders to really dig down to the obstacles blocking Black progress in areas like economics, housing, education and criminal justice. Or maybe he won’t. But he’s no longer afraid to talk about it. But there was no clearer indication about his new attitude than when he brought on the stage Keegan-Michael Key, half of “Key and Peele,” the comedic duo that has become pop culture icons through a hilarious, irreverent Comedy Central show that loves to puncture racial stereotypes and expectations. The duo received a great deal of attention with a skit about the president having a Black “anger translator” named Luther, who could tell the world what Obama was really thinking when he gave his normally measured comments to the media or in a speech. This is a theme that Saturday Night Live picked up with a skit about the president turning into The Rock-Obama, with an angry Duane “The Rock” Johnson playing the president, his muscles busting out of his suit like The Hulk. As the president delivered his straight lines during a hypothetical speech, Key was standing next to him shouting what the president really meant. “It’s just nasty!” Key screamed. Obama said Hillary Clinton would have to raise a lot of money in her campaign.